About "Comparing proportional and nonproportional situations"
We can use what we have learned about proportional and nonproportional relationships to compare similar real-world situations that are given using different representations. A laser tag league has the choice of two arenas for a tournament. In both cases, x is the number of hours and y is the total charge. Compare and contrast these two situations. Arena A’s equation has the form y = mx + b, where b = 0. So, Arena A’s charges are a proportional relationship. The hourly rate, $225, is greater than Arena B’s, but there is no additional fee. 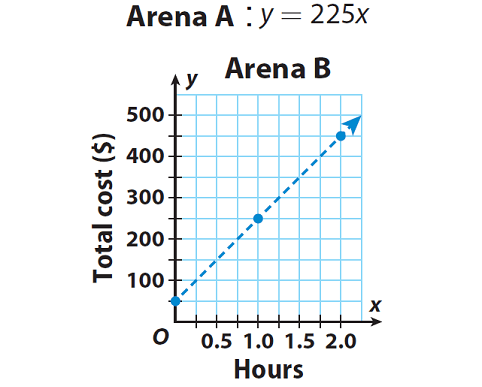 Arena B’s graph is a line that does not include the origin. So, Arena B’s charges are a nonproportional relationship. Arena B has a $50 initial fee but its hourly rate, $200, is lower. Jessika is remodeling and has the choice of two painters. In both cases, x is the number of hours and y is the total charge. Compare and contrast these two situations. Painter A’s equation has the form y = mx + b, where b = 0. So, Painter A’ s charges are proportional. The hourly rate, $45, is greater than Painter B’s, but there is no additional fee. Painter B’s table is a nonproportional relationship because the ratio of y to x is not constant. Because the table contains the ordered pair (0, 20), Painter B charges an initial fee of $20, but the hourly rate, $35, is less than Painter A’s. Compare and contrast the following two situations. where c is the cost in dollars and h is the number of hours you attend. Test-Prep Center B charges $25 per hour to attend, but you have a $100 coupon that you can use to reduce the cost. Test-Prep Center B is cheaper for less than 20 hours.